"Cover-collapse" sinkholes occur when groundwater causes underground gaps that grow so big the ground above can’t support them. These can be dramatic events, since the holes can grow big enough to swallow a house, a road, a field or a swimming pool, even as those above ground go about their lives completely oblivious to the growing danger. Are there other types of sinkholes? There are two other kinds: "solution" and "subsidence" sinkholes, which don't make the nightly news. That's because the changes to the topography happen slowly over time without catastrophic results. 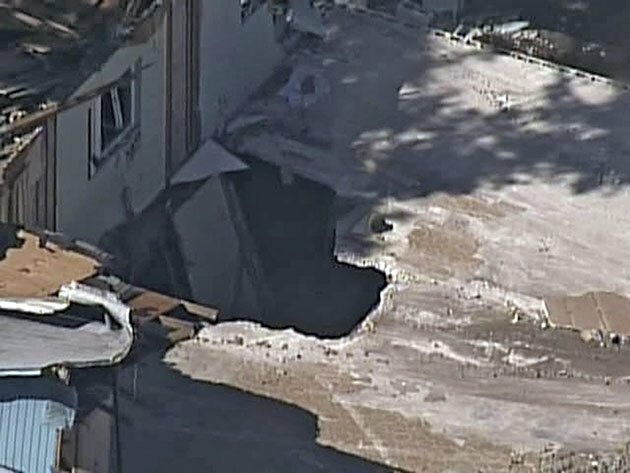 The entire state of Florida is prone to sinkholes since it sits on top of a layer of limestone rock known as karst, which can be dissolved by acidic groundwater, according to the Florida Department of Environmental Protection. According to the U.S. Geological Survey (USGS), other vulnerable states include Texas, Kentucky, Alabama, Missouri, Tennessee and Pennsylvania. Unlike hurricanes or earthquakes, sinkholes aren’t tracked. But CNN reports that from 2006 to 2010 in Florida alone, there were 24,671 insurance claims for sinkhole damage, totaling a whopping $1.4 billion. Yes. According to an interview with Randall Orndorff a U.S. Geological Survey supervisory geologist, human activities like drilling for a well or mining, which lower water levels underground, can cause sinkholes. So can putting up buildings and parking lots, he added, which changes where water drains. “Instead of the water naturally soaking into the ground, it's now running off and being concentrated—being put into the ground at one point," he said.